IV therapy at home is a unique gift for family and friends this holiday season. Vitamin drips are a great way to help your loved ones stay healthy even in the middle of cold and flu season – or to recover quickly when they’re under the weather. Why Gift IV Therapy at Home? We all have that one friend or family member who gets sick like clockwork when the weather gets cold. That’s why IV therapy at home is a great gift idea this holiday season. Drip Hydration offers nine specially-blended formulas designed to improve a wide variety of conditions. In addition to our nine proprietary blends, Drip Hydration can create custom blends tailored to your specific preferences and health needs. We also offer add-ons including anti-inflammatory and anti-nausea medication for fast and effective relief from aches and pains. Our Vitamin B12 shots are perfect for a quick mood and focus boost. Drip Hydration is a mobile IV service, meaning that your loved one doesn’t have to trek to a clinic for our IV treatments. We offer direct-to-you IV delivery anywhere in Los Angeles. In addition, we are now servicing Manhattan neighborhoods up to 96th street. Our immune boost IV is especially popular during cold and flu season, which coincides perfectly with the holidays. This IV is packed with cold and flu-fighting vitamins and antioxidants such as vitamin C, B-complex vitamins, and a glutathione push to help prevent that pesky cold that’s going around the office. If you already have a cold, meanwhile, our immune boost IV can help your body fight off what’s ailing you and help you feel better that much faster. The original formula that started it all, our Myers Cocktail is a versatile blend that can improve a variety of conditions from fatigue to headaches and more. This IV is ideal for someone who has never had an IV treatment or who doesn’t have a specific ailment that needs to be treated. For an all-around feel-good IV, there’s none better than the Myers Cocktail. Now that difficult-to-shop for uncle can truly say he ‘has it all’. Our All-Inclusive formula is a supercharged combination of vitamins, amino acids, and antioxidants that promotes full-body wellness. This formula is a true winter pick-me-up that is sure to have you feeling great. Give the gift of health this season with Drip Hydration. 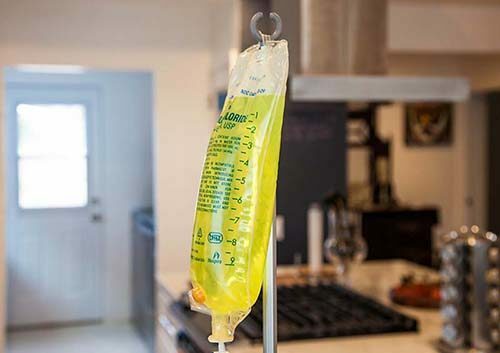 We bring the benefits of IV appointments directly into homes, offices, hotels, and more in Los Angeles and Manhattan. Your IV recipient doesn’t need to travel across town or wait in a clinic. We bring the appointment to them whether they are at home, at the office, or even at the gym. The possibilities are endless. We make IV therapy at home as easy as picking up the phone or booking online. We fit into your schedule so you don’t need to worry about missing an appointment. We service neighborhoods in Los Angeles and Manhattan up to 96th street. In addition to regular appointments, we offer on-demand services for treatment within an hour, based on availability. Have questions? Want to know more about how gifting IV therapy at home works? Give us a call! Our staff is more than happy to answer any questions that you may have. We’re excited to help you give your loved ones a truly unique experience this holiday season.